Tim Tait is one of Te Papa’s talented IT developers and one smart cookie. He put together the fabulous touchscreen image browser which you can find in our Kura Pounamu exhibition – and after more of Tim’s hard work this is now available on our website. 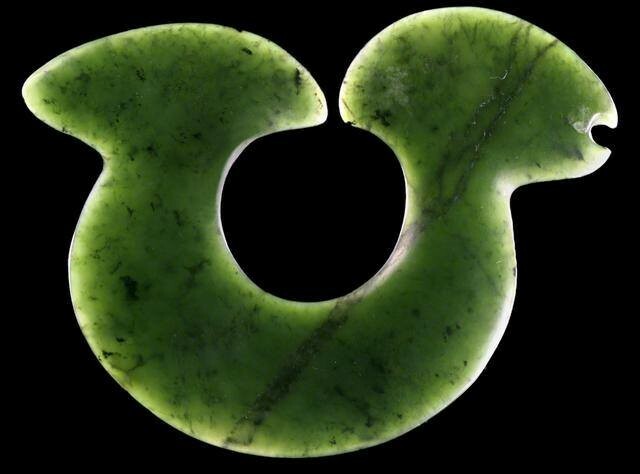 All 200 of the incredible pounamu taonga on display in the exhibition can be explored. You can zoom into the images and get incredible detail. For example you can see the intricate shaping of the suspension hole in a hei tiki. The patterning and mineral inclusions in the different types of pounamu become clearly visible, as in the image above of a hei matau (pendant) made of kawakawa. In some cases what you can see is better than if you were able to hold the taonga in your hand and view it up close. I can’t help thinking that this is a great research tool. It will help increase our knowledge and understanding of these taonga and the pounamu they were made from. I’m told that the technology at play behind the display is a web browser running Silverlight 3 hardware accelerated in full screen mode. You can read more about the techie stuff here [link no longer available], plus see a great video of Tim at work! I’ve spent ages trying to open the actual archive of the collection and just keep getting sent round and round to annoying explanations… all I want to do is SEE THE COLLECTION!!!! WHY SHOULD THAT BE SO HARD???? ?